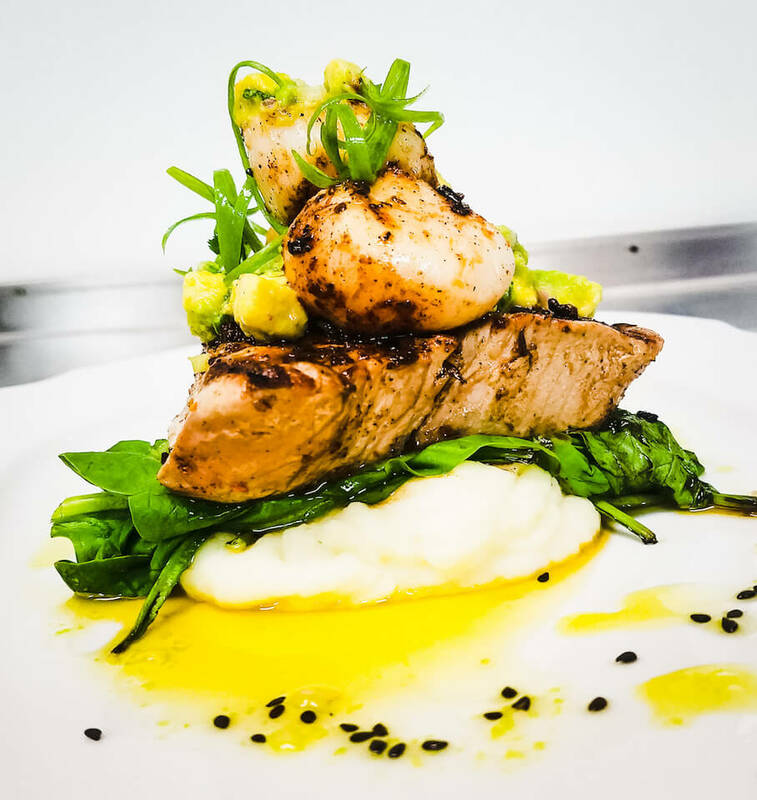 A-Bay’s Island Grill is a family friendly restaurant serving local favorites, seafood, and Pacific Rim cuisine. 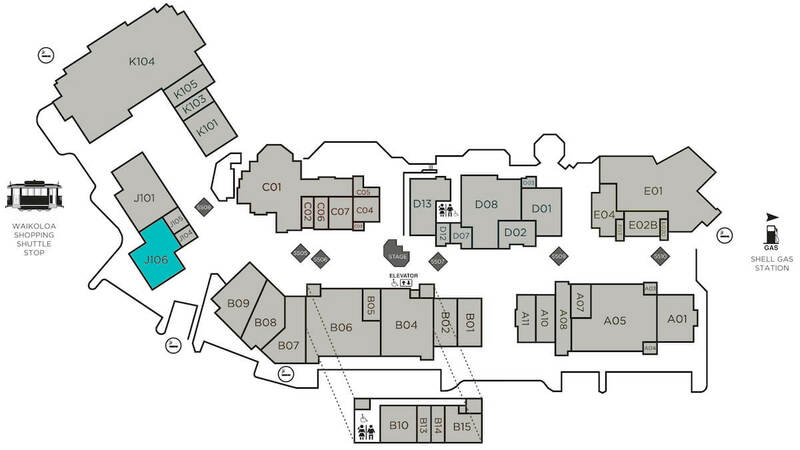 We are situated in the Waikoloa Beach Resort at the King’s Shops. We offer an indoor air-conditioned bar and dining area as well as open air umbrella covered dining area. We keep the budget oriented in mind as well as those wanting that special dinner prepared by a renowned Chef. 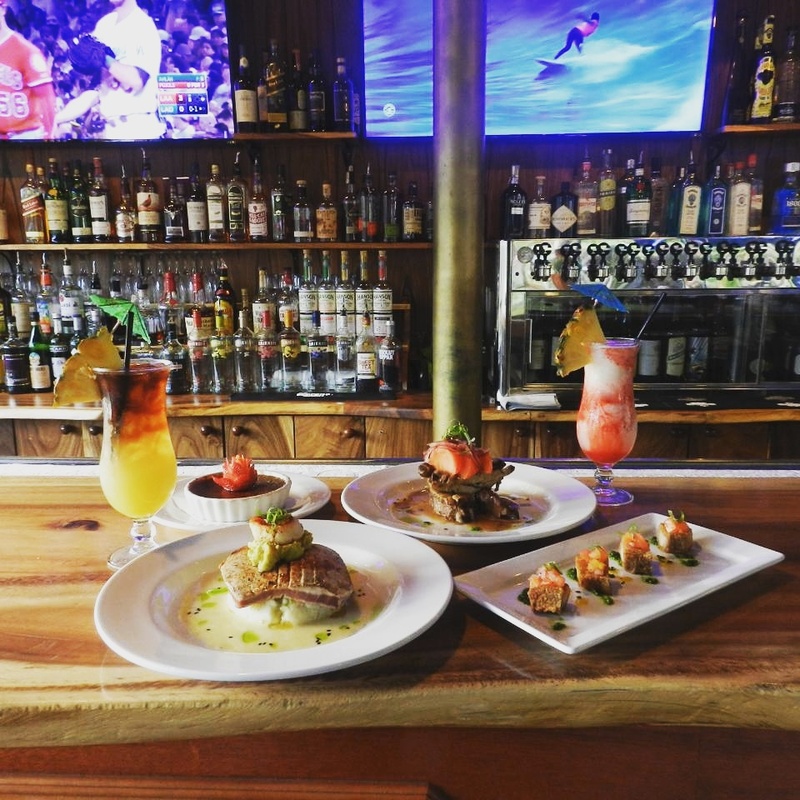 Come enjoy great food and cocktails, unbeatable service and a taste of the Islands! Our Executive Chef Darcy Ambrosio was born and raised on the Big Island of Hawaii and currently resides in the town of Waimea. Darcy has found a home at A-Bay’s where his classical training, informed creativity, and wealth of knowledge can be seen in every dish. Chef Darcy Ambrosio’s culinary journey began with humble beginnings and a youthful drive and dedication that is still present to this day. After high school, he began with scrubbing dishes at the Mauna Kea Beach Hotel. He quickly moved into a position as a line cook at the then infamous “Batik” restaurant. Finding his passion early led him to be taken under the wing by the classical European Chef’s that the exclusive resort was proud to bring on at the time. Darcy Ambrosio was a name that could not be ignored and through encouragement was driven to endure the rigorous Westin Culinary apprenticeship program. Darcy spent the first two years at the Mauna Kea Beach hotel and transferred to the Kaanapali Resort on Maui for his final year of training. This three-year program left nothing out allowing him to learn all facets of cooking and restaurant kitchen management including, but not limited to; butchering, grand mangier, saucier, pantry, hot line, purchasing and receiving, lunch, breakfast, and of course dinner. Upon completion of the program not only was he graded on creating a seven-course menu and wine pairing physical and taste evaluation he had to pass a 110-page written exam. To nobodies surprise, he passed with flying colors making him the first Graduate from Hawaii to complete the rigorous Westin Culinary Apprenticeship. Graduating with Honors was icing on the cake. With the newly acquired skillset, he was offered his first full-time chef position with the Ritz Carlton in Laguna Nagel, California. Here Darcy continued to learn and expand the Pacific Rim genre of cuisine while continuing to utilize his classical training. When the call of the Islands returned, as it does many who leave, Darcy returned to the Island with a wealth of knowledge and experience under his belt and was quickly hired by the Hapuna Prince Hotel. From there Chef continued to work along the coastline opening the Ruth’s Chris Steakhouse at Mauna Lani, then worked as a private chef to the lucky residents of Hali’i Kai to then return to Ruth’s Chris Steakhouse until finding his new home at A-Bay’s Island Grill where the guest can taste the journey and pride that only Chef Ambrosio can provide. Chef Darcy Ambrosio enjoys cooking, recreating classical dishes and making people happy. Darcy is still a true local boy and his favorite food is still (you’d never guess)…SPAM! The inside area consists of an ample bar, cocktail tables, and dining tables. The bar and tables are handcrafted from locally sourced Monkeypod wood. The Frostrail at the bar is one of only a few in Hawaii. We offer a 24 tap beer tower with a focus on local breweries and craft beer. We offer traditional tropical cocktails as well as the timeless classics. Your knowledgeable bartender can guide you to an exceptional cocktail whatever your mood. Our in-house Cicerone can pair your meal with the perfect beer. The wine list should also satisfy any connoisseur and is crafted to be paired with our exceptional food menu. Relax and grab a table in the open air. Protected from the tradewinds the outdoor setting is great for enjoying the year round perfect weather we are blessed to experience. Your knowledgeable staff is pleased to help as you relax and enjoy . The kitchen speaks for itself and the environment is one welcoming anybody who cares to sit down and be impressed. Ask your server for the daily specials and prepare to enjoy. Come in aloha casual or aloha formal attire. You’ll never feel out of place. 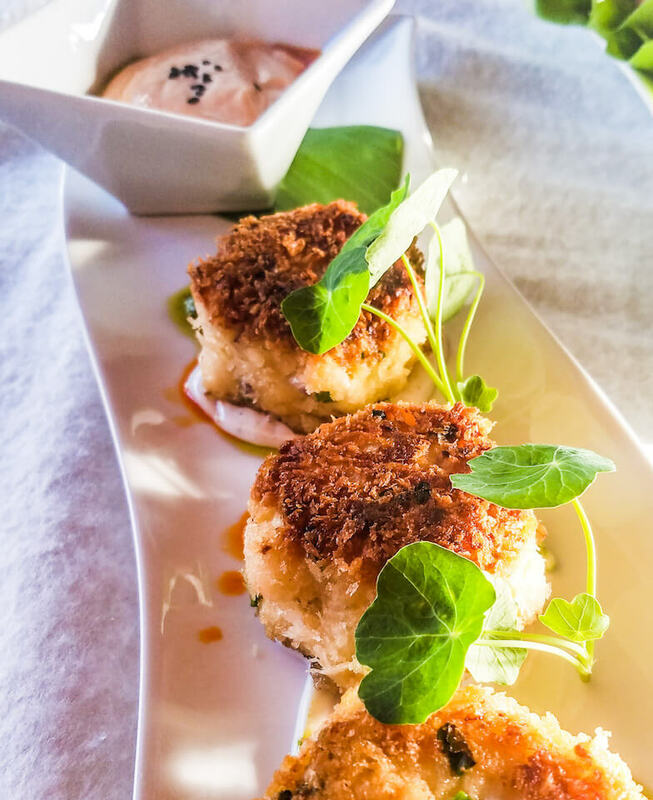 Check out our food and cocktail menus below! View our menus by selecting the appropriate tab below. Sandwiches served on fresh Ciabatta bun topped with lettuce, tomato and onion. Choice of french fries, side farm salad, or house coleslaw. Click here to download a PDF version of our dinner menu. Choice of link sausage, Portuguese sausage, apple wood smoked bacon. Includes home fried potatoes and whole wheat toast. Poached eggs, grilled seafood cake, sauteed arugula, grilled tomato and hollandaise. Includes home fried potatoes. Three egg omelet. Choice of three: bacon, Portuguese sausage, ham, spinach, onion, tomato, mushroom, cheddar cheese, mozzarella cheese. House made braised corned beef hash with fried rice and two eggs your way served in a skillet. Click here to download a PDF version of our lunch menu. Sandwiches served on fresh Ciabatta bun with your choice of french fries, side farm salad, or house coleslaw. All topped with lettuce, tomato and onion.